If you’re a producer or audio engineer in today’s industry, pitch correction software has likely found a way into your workflow in some sense or another. Whether it’s to provide slight pitch adjustment to a singer’s performance who fell slightly flat on some various notes, or to deliver a hard “T-Pain” effect at the request of the rapper you are working with, pitch correction has become a big part of our lives — albeit a somewhat controversial topic. One of the first companies to deliver its high-class software for pitch correction was none other than Antares, who launched Auto-Tune back in 1997. Since then, it has grown so much in popularity that the term “Auto-Tune” has become a blanket verb for pitch correction used by almost everyone nowadays. Now, Antares has brought Auto-Tune back into the limelight but in a much different way. 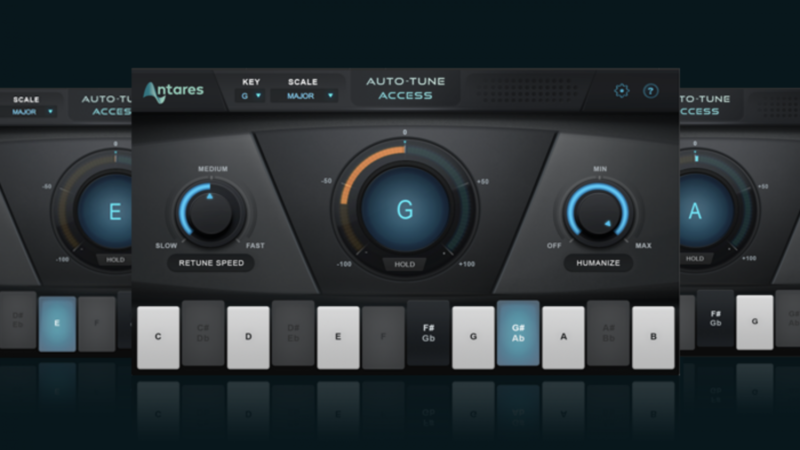 The company announced its new software, Auto-Tune Access, at NAMM 2019. It’s aim is to put Auto-Tune into the DAW’s of every engineer and producer, by making it more affordable than ever. Auto-Tune Access is a stripped down model of the regular Auto-Tune Pro, and navigating the plugin is now easier than ever. Across the top, users are provided drop down menus to select their desired key and scale, to provide a pitch grid for the incoming signal to snap to. To the left is a “retune speed” knob, which is variable between slow, medium, and fast speeds, or anywhere in between. In the middle is the pitch display, which notates the general pitch of the incoming signal, and meters to the left and right to show if the actual pitch is slightly sharp or flat relative to the desired pitch. To the right is the humanize function, which is a knob that can be adjusted to allow for “mistakes” here and there, or otherwise to allow for a more “human” characteristic. Antares Auto-Tune Access is available with a price tag of just $99, which makes this an easy buy for anyone who needs to include even a simple piece of pitch correction software in their workflow. To buy Auto-Tune Access for yourself, you can head over the Plugin Boutique.